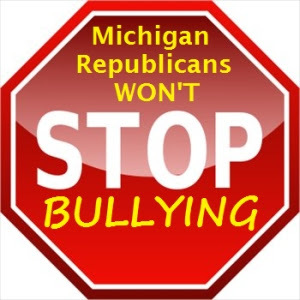 The horrible so-called anti-bullying legislation passed by the Michigan State Senate may still be stopped. The State House has the opportunity to restore sanity in that bill. And, of course, Governor Snyder should veto the bill should it arrive on his desk. The people of Michigan must stop this travesty. They must call their elected representatives and complain. The so-called anti-bullying law creates a special protected class of people. If the bill becomes law, it will be legal for alleged Christians to bully - torture - anyone that seems to not live up to their Biblical views of modesty, propriety, and morality. These Christianists will have special rights. Special civil rights that allow them -- teachers, parents, students, principals, and other school personnel -- to make public comments and remarks about EVERYTHING and ANYONE that does not square with their particular religious beliefs. So, go ahead and tell Johnny his mother is a whore because she wasn't married to his father. Tell sweet Sue that she will burn in hell because she is not a virgin. Tell Ralph that God never intended for his African-American father and white mother to be married, let alone have children. And, of course, any child that seems to be or may actually be gay will come to school with a target on his or her back. It will be open season on LGBT youth, their parents, and family. I am ashamed of the Legislature in Michigan. It has been taken over by religious zealots that don't support public education. They certainly don't care about Michigan's children.